What does a Spanish dancer have to do with a winery that has a French name? Absolutely nothing and everything. It was one of the first artworks Dave did about the same time he and Helen started making wine at home. It has been the wineries logo since they were garagistes wine makers. They took Best of Show at the Sacramento Home Winemakers wine competition with the first wine they ever made, a 2000 Syrah. They were hooked on winemaking ever since. Although Helen is half French, Dart is a pure English name. They are now living on their Cabernet Sauvignon vineyard where the winery is located. The tasting room is a feast for the eyes. Dave and Helen have filled the room with Dave’s photoart that echo’s their travels to different parts of the world. Most days Helen is on hand in the tasting room where she loves to talk about her special wine-complimentary recipes and cooking along with everything to do about wine making. 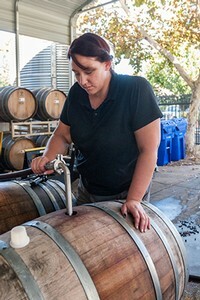 Through the tasting room you move into the barrel room where Dave and his Daughter, Jessica do all the wine making. They divide their duties by Jessica managing the fermentation and barrel aging while Dave waits to do his master blending and bottling. Our d’Art team is our most valuable asset. 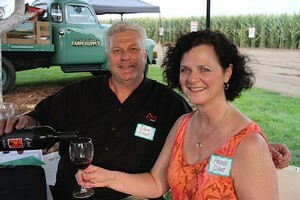 Come see us at the tasting room, we love getting to know our customers!